Mount Stewart lies on the sheltered Western shore of Strangford Lough, just south-east of Belfast. 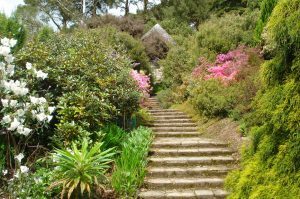 Surrounded by sea water warmed by the Gulf Stream and at nearly 55 degrees north, Mount Stewart enjoys a very favourable microclimate, especially for those plants from the Mediterranean climate zones of the world. 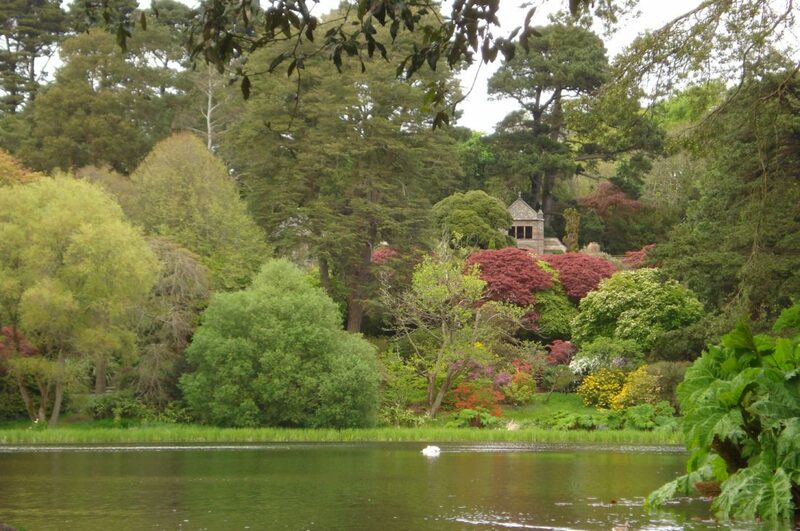 The recently restored house and formal gardens are redolent with rich allegory and stories of Greek and Celtic mythology – all from the imagination of one extraordinary woman, Edith, Lady Londonderry. Laid out in the early 1920s on an ambitious scale, there are some 70 acres to explore. 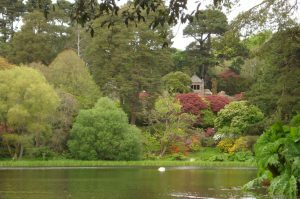 At Mount Stewart, the family burial ground on the far side of the Lake from the House is known in the Scots Gaelic as Tir n’an Og, The Land of the Ever-Young. Almost hidden amongst the canopy of trees, the turrets take on an ‘other-worldly’ aspect, as if from a fairy-tale. This part of the garden is the warmest and most sheltered. Here we attempt to grow many of the most tender plants in the garden. There are secluded benches where you can sit back and enjoy the tranquillity. Sadly, the actual burial ground is still private, but you can look through ornate Peacock frieze gates, a copy of Byzantine originals in Ravenna, Italy, made by the local blacksmith and estate plumber, Mr Walker.